Image Credit: Solar Dynamics Observatory, NASA. 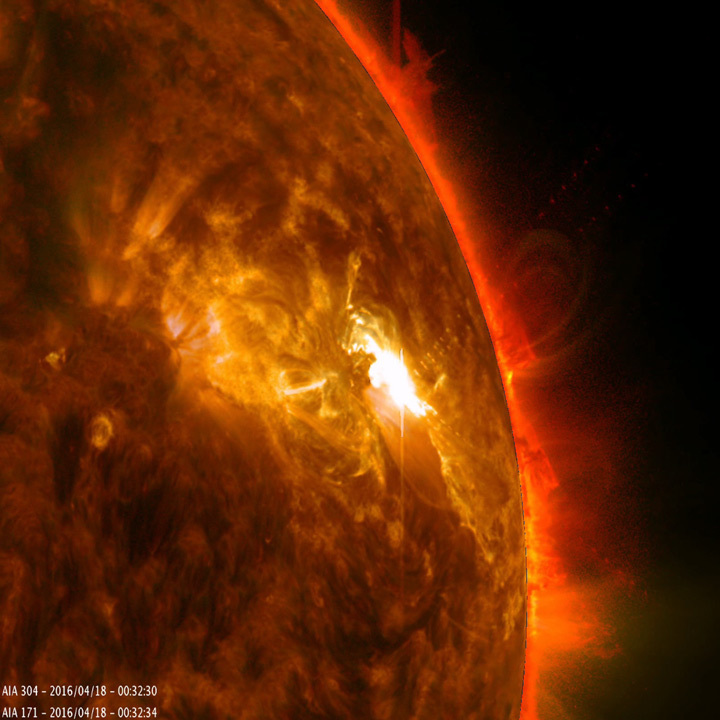 April 26, 2016 – On April 17, 2016, an active region on the sun’s right side released a mid-level solar flare, which can be seen in this movie as a bright flash of light. The outburst sent a cloud of radiation and plasma into space. Solar flares are powerful bursts of radiation. Harmful radiation from a flare cannot pass through Earth’s atmosphere to physically affect humans on the ground, however — when intense enough — they can disturb the atmosphere in the layer where GPS and communications signals travel. The movie shows imagery from NASA’s Solar Dynamics Observatory, which observes the sun constantly to help scientists understand what causes eruptions like these. The flare shown here was of moderate strength and only caused brief radio blackouts, according to NOAA’s Space Weather Prediction Center in Boulder, Colorado. This video was captured in several wavelengths of extreme ultraviolet light, a type of light that is typically invisible to our eyes, but is color-coded in SDO images for easy viewing.